Neil Witikko leads a meeting with faculty members. In September 1979, college student Neil Witikko turned in a research paper. Eager for meaningful feedback from his professor, he was crestfallen when he got his paper back with no comments. The grade was satisfactory, but he had very little to work with to improve for his future assignments. Now that Witikko is the director of the College's Center for Teaching and Learning, one of his goals is to help St. Scholastica's faculty members deliver rich, quality feedback to their students. During a recent session with a group of new faculty members, he pointed out that academic uncertainty is a leading cause of student anxiety. "Are we setting students up to perform better on Wednesday than they did on Tuesday?" he asked. Witikko, an associate professor of Education who has been with the College since 2012, is the former K-12 Teacher of the Year for the state of Minnesota. He now devotes his considerable energy and expertise toward helping his colleagues - and their students - shine in the classroom. 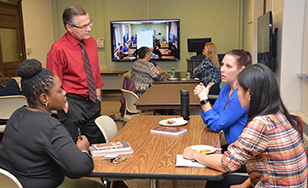 As he sees it, his charge is simply to formalize the many great things that are already taking place on campus, from creating consistent standards for professional development to widely sharing what's working in faculty classrooms. "The center allows us to build on some wonderful things that were already happening but to give that support cross the College," said Witikko, who holds an Ed.D. from the University of Minnesota - Duluth in Teaching and Learning. "I just think it fits what it means to be a Benedictine institution. It should be our goal to make people want to stay at CSS. It should be our goal to make faculty members feel supported." He makes himself available for consultations and classroom visits as well. For instance, he has spent a considerable amount of time meeting with Physician Assistant faculty members, helping them apply their vast clinical experience and knowledge to a classroom setting. "Neil has been putting in overtime to get the PA faculty to a place of not just good but great teaching as we launched our first class last year," said Kim Kruger, M.D., PA program chair. She called his help "absolutely essential." It has been a rewarding experience, Witikko said, that translated to success for the College's first class of PA students. "We have medical doctors who are coming to CSS in a teaching capacity, but who also work during the week in their own clinics," he said, "so they've just been very hungry for any kinds of teaching resources. They want to do their absolute best for their students. Their commitment has just been incredible. "It really opened my eyes to the importance of our center," Witikko said.